Obedience class is brilliant. That’s what I’ve realized. My dog is smart; obedience class is brilliant. I wish they had something similar for children, because we could sure use some obedience out of them. Asher has decided the class is boring and he hates it and threw a tantrum. Maya has decided the same, but being older and more mature, she merely whined heavily. We forced them to go anyway. I’m not sure that counts as obedience. There were only three other dogs this time, and Jasper and the Great Dane, Tumnus, really wanted to play. When the instructor tried to demonstrate appropriate doggie interaction, she chose to have Jasper go with a very short-legged lab mix (looked kind of like a corgi) and Jasper ignored its existence entirely, choosing to watch me for possible treats instead, which got a laugh out of the class. The instructor taught us two of the most important commands so far: ‘leave it’ and ‘drop it.’ Jasper likes to counter surf, snagging any food not watched closely. He’s also fond of chewing rocks and trying to eat garbage left on the ground, and spring has brought us lots of both. The instructor chose the youngest dog, dropped several treats on the floor in front of him, then stood on them. We got to watch the cute, rolly-polly little puppy do everything in his power to try to dig those treats out from under her shoe. It was adorable, but what did it have to do with teaching him to leave it? The moment he lost interest, however briefly, she said, “Yes!” And gave him a treat. After that, it took him remarkably little time to figure out that when he wasn’t going for the obvious treats, the nice lady just handed him one! ‘Drop it’ involves playing tug-of-war with a toy for a moment, then just holding still until the dog lets go. The moment he does, he gets rewarded. I could not figure out how to get a dog to leave something interesting, but this is so easy, and it works like a charm. I love obedience class. Now I just command, “Leave it!” and he runs over to me for a treat instead. I have to carry carrots everywhere, but that’s a small price to pay. I taught him by leaving piles of carrots or banana on chairs and covering them with my hand. It took him about 3 treats to start ignoring the stuff I left on surfaces, to the point where it actually became difficult to try to use the phrase ‘leave it,’ since he wouldn’t go for them in the first place, but just sit and look expectantly at me as soon as he sees something lying there. It has put a complete halt to the annoying counter-surfing. Here’s the one thing I don’t get. I taught him ‘leave it’ with one of Maya’s less beloved (less beloved by Maya, much beloved by Jasper) tiny bears. After two or three tries, he stopped going for the bear. I left it enticingly at the end of the bed while reading the kids stories, and he sat and stared at it. A couple of times, he reached his nose forward to it, then just backed off, clearly thinking the better of it. I don’t know why he did that. I would think that in his mind, the connection should be – try to grab something forbidden, don’t actually get it, get a treat. Not even trying doesn’t earn him anything. And yet he obviously realized the bear was off-limits and gave up on it. I don’t know if that makes him smart or dumb. Maybe too smart for his own good, in a way. Another way he’s too smart for his own good is that he actually figured out how to get around that ridiculous cone I shelled out ten bucks for. He manages to hook the cone under his thigh and use the leg to shove the cone back on his neck just far enough to give him access to his incision. For his smarts, he earned himself underpants. 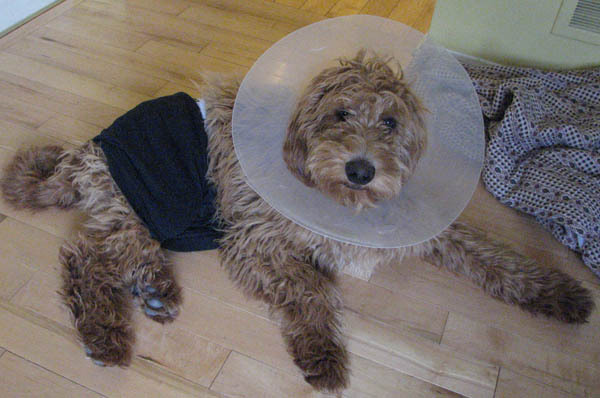 He is now walking around in a cone and a pair of snazzy boxer-briefs. One or the other alone doesn’t do the trick, but both make the effort too much, and he gives up. 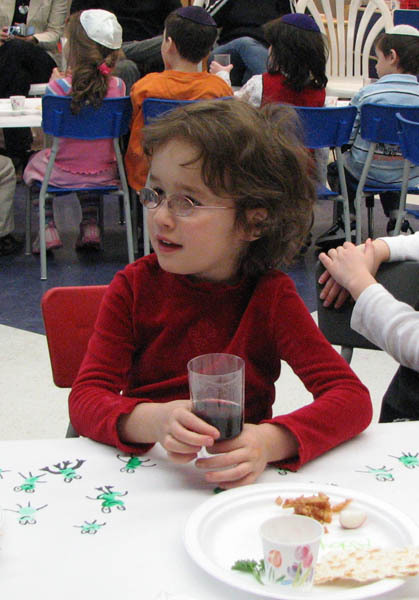 In non-doggy news, because I apparently also have children, Boo had her model seder at school today. It is a little performance the kids put on. While we watch, they sing some cute songs about how mean pharoh was and about plagues (the frog plague is a popular one; don’t hear much about rivers of blood), yell out some rehearsed answers about why we eat matzah, and refuse to try the bitter herbs. Boo liked the ‘wine’ best. My family should be proud. He looks happier there — in fact, almost like he’s smirking. I think he has you figured out!